Social media… The one place you know for sure that your ideal candidate spends some time on a daily basis. Knowing how to use social media to source candidates has now become a core skill for recruiters. Running recruitment ads on these platforms can be a very effective way of finding good candidates for your open jobs. But how do you get started? How do you even run campaigns on different social channels? We know that without a background in marketing this can all be overwhelming. No worries though, we’ve got you covered! Where to start your social recruitment ads campaign? Recruitment marketing is more than just launching ads and hoping for the best (while you could still just do that, we strongly advise you not to). In order to make the most of your paid efforts, you need to start out by doing some research. A good starting point is to first create your candidate persona. A candidate persona is the recruitment version of a buyer persona (often used in marketing). It refers to your ideal target candidate for the job. The goal is to make the persona as realistic and detailed as possible. In order to make a good persona you will need to think about demographics, personality, social circles, and interests. The goal is to make the persona as close to a real person as possible. So how do you build a candidate persona? How to build your candidate persona. Your candidate personas should not be based on gut feeling alone. In order to get an accurate candidate persona, you will need to gather some data. The best way to gather data is to involve current employees and major stakeholders in the hiring process. By sending out some surveys or doing short interviews with them, you can get a better idea on your ideal candidate. After all, the employees are the ones that will have to work with the new hire. Their input is crucial. Major stakeholders can include people like the department manager or team lead. They often know what they need in terms of skills and experience and can give you some valuable input into the ideal candidate. Demographic info; age, location, current job etc. Personal characteristics; strengths, weaknesses, hobbies, interests etc. Goals; where do they hope to go in their career? Any other information that you can easily gather could be able to help you write out your candidate persona. Beware of overloading yourself with data though. Use your judgment as to what is relevant to know and what is not. With all your data collected and in one place it is time to analyze it. In this phase, you will see that your personas really start to take shape. So how do you analyze all your data? You want to start by opening up your spreadsheet and put in all your hard data first. This mainly includes demographic data. Make sure that all your data is formatted in the same way to help you recognize patterns quicker and more accurately. Data that you gathered through interviews should also be included in the spreadsheet. The best way to do this is to create categories for the answers to each question you asked. This way you turn the unstructured interview data into structured and quantifiable data. When all your data is nicely structured into your spreadsheet, you can check the statistics on it. What was the average age of your ideal candidates from the past? What educational backgrounds did they have? What skills did they possess? How experienced were they? These questions can be answered by checking the statistics. With all the data organized neatly you can start making your personas. Ideally, you’ll be able to create upto three personas per job opening as there’s usually more than one ideal candidate for the job. Your personas should not just be a job description. It is important that you make them as realistically human and as lively as possible. Don’t hesitate to get creative; make up a name for your persona, put a picture next to it, come up with a life story etc. The more detailed your personas, the better you’ll be able to target them and find your ideal candidate. An important thing to include in your persona are the psychographics. If you collected the right data, you should be able to derive these from your spreadsheet. Psychographic data differs from demographic data as they are about a person’s values, beliefs, and interests. It is very personal information and can be hard to obtain. 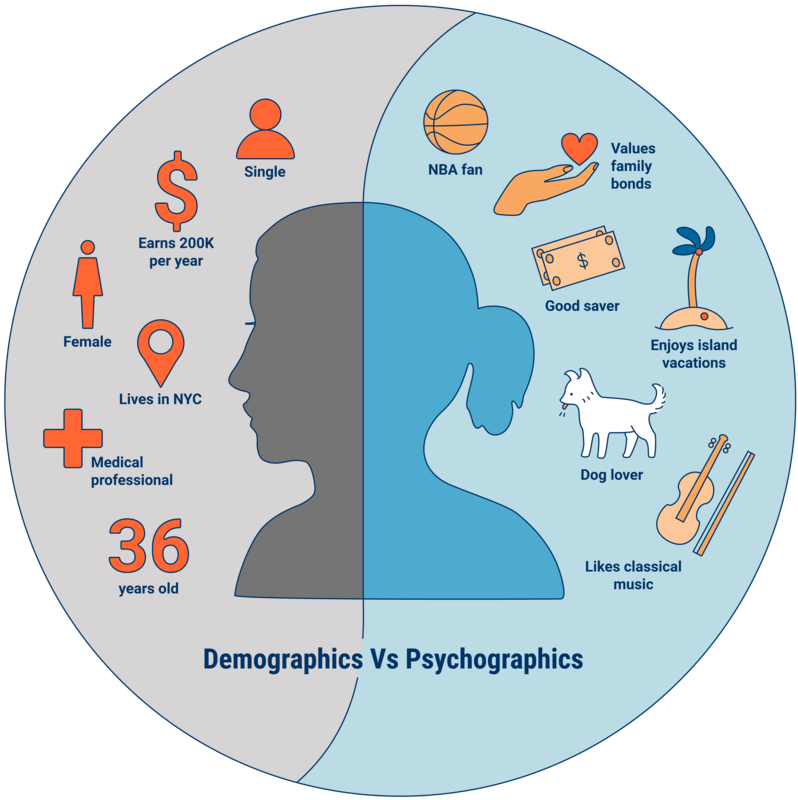 The following image shows the difference between psychographics and demographics well. Linkedin is not included in this list as it is a recruitment platform with lots of sourcing functionalities. Aside from Instagram, each of the social media channels mentioned above has its own ads platform. They are all quite similar in use and often have similar functionalities. The main differences are the ad formats and requirements for the images/videos. All channels give you a lot of options to target very specifically. This is why your candidate personas are so important. They help you to decide who to focus your social ads on, which will make your ads more effective and cheaper. We’ll walk you through each channel below. Instagram and Facebook are by far the most popular social networks today. Facebook alone has more than 1 bilion active users a day. Both networks share the same ads platform which can be accessed here. Facebook’s ads platform has one of the most extensive targeting options of all social ads channels. This makes it easy for you to target your personas with your ads. Facebook also has a dedicated “Facebook for Jobs” feature that you can use to post job ads on. Paid advertisement should be a part of any serious facebook recruiting strategy. Once you have your account set up and your payment details entered, you can start creating your first campaign. Head over to the campaigns tab in your Facebook Business Manager and click the green button on the left side of the screen. In the next screen you can choose your campaign objectives. For job ads, I highly recommend to pick “Traffic” as your campaign objective. The traffic objective allows you to lead people to a specific landing page and you can pay per click rather than impression. Also, most of the other objectives don’t allow for the appropriate formats for job ads. Don’t forget to give your campaign the appropriate name for easy recognition in the campaigns dashboard. At the bottom of the screen, you can also choose whether you want to do an A/B test within the campaign. A/B tests are experiments that allow you to test different ad texts, images, and even audiences to see what performs best. The most important part to focus on is the audience you want to target and the ad that you are targeting them with. Aside from all the demographic targeting options, Facebook also allows you to target very specifically on psychographic variables. You can target people based on their interests, activities, pages they like, behavior, and interactions they had with your business or site. You can even define a specific audience (for example; people that have visited your careers page) and then target people that have similarities to that specific audience as determined by the Facebook algorithm. Knowing what and how to advertise to your specific target audience is just as important as picking the right audience for your job opening. When you’re targeting people with a certain amount of experience, for example, you’ll want to make sure that your ad copy and image reflect that. Once you’ve reached the ad set part, you can start defining your audience. You can choose to use a previously saved audience or a custom audience. Custom audiences are usually people that have visited your website or look alikes of people that have visited your website before. Saved audiences are built in Facebook Business Manager and are based on the data Facebook has on their users. In order to target more specifically, you can narrow your audience. Narrowing your audience ads an extra layer of interests, demographics, or behaviors that must also be matched in order to be targeted. This way, when you target a specific interest that is quite popular, you won’t end up with a huge audience of irrelevant people. So how do you know that the audience you created is the right one for the job that you’re advertising? Well the answer to that is, you don’t. At least, not right from the start. That’s why you need to have an experimental mindset and be willing to test things out. Only by continuously trying out different audiences and ad images/texts will you be able to find good candidates for your openings. It is very rare to hit the mark right from the start in social advertising. A great way to test different audiences for your ad is to do an A/B test. An A/B test in advertising means that you create two different versions of the same ad and test which one performs better. As you can see at the bottom of the first screenshot, Facebook allows you to do A/B tests in your campaigns. With this functionality you can test two different audiences for the same ad or two different ads for the same audience. This can then help you to pick the most effective version and scale this up. Another way to test different audiences is to just launch an ad and see how it performs. If the most essential metrics aren’t as good as you want them to be, you can make some changes to the ad or audience and see how it goes from there. Knowing how to interpret your ad metrics is crucial to understanding whether your ads are effective or not Facebook has extensive reporting on your campaigns that can really help you to understand how your ads perform and whether they are worth the money spent on them. The CTR and conversions are the most important metrics there is for social ads. The CTR shows the relevance and quality of your ad and also tells you whether you have chosen the right audience for what you’re selling. Your conversions show how many people actually applied for the job after clicking or seeing the ad. Important to note is that you can only track conversions if you have setup the Facebook tracking pixel properly. So make sure to contact your marketing or development team to setup the pixel correctly on your careers site. The cost per conversion is also important to look at of course. You don’t want to be spending too much per applicant. The cost per conversion also says something about the quality of the landing page. A high cost/conversion usually means that many people click on your ad but don’t complete the application form on your landing page. If this is the case you should consider making some changes to the landing page. Frequency is a metric you might not have heard of but is crucial to look at. The metric refers to how often the same people see your ad. Typically, you wouldn’t want people to see your ad more than 3 times as it might become annoying for them to constantly see the same ad (which then affects the quality score of your ad). You can affect the frequency by increasing the size of your audience. Important note on advertising through the Facebook Business Manager: Ads for Instagram are also done through Business Manager. By default, the ads you create for Facebook will also run on Instagram. When you are selecting your targeting options in your ad set, you can change whether you want your ad to show up on Instagram as well or whether you only want to show your ads on Instagram. Just like Facebook and Instagram, Twitter also allows you to define your target audience very specifically. You can target people based on their demographics, behavior, events they’ve engaged with, interests, keywords they’ve searched for on Twitter, and how they’ve interacted with your website in the past. This makes it easy for you to target your candidate personas on the social network and get the right people to click on your ads. Promoted tweets: similar to Facebook’s ad formats. Here you create a tweet and boost it to be shown to your defined target audience. Promoted accounts: gain followers by promoting your account to specific Twitter users. Promoted trends: promote a hashtag to appear on the trending topics list. When someone clicks on the promoted trend they will see your promoted tweet on top. This ad format is very pricey and definitely not fit for job promotions. Just like on Facebook, it is crucial to keep an eye on the campaign metrics in order to know whether you’re getting the results that you want. For Twitter, you’ll also have to install a tracking pixel as well in order to do remarketing and track conversions. Quora is quite different from the channels described above in the sense that it is purely a question and answer based social media platform. The platform is not used to connect with family and friends but rather to find an answer to a problem. It also looks more like an online forum rather than a social media platform. The quora ads interface is quite simple and clean. The ads are relatively cheap and targeting can be done based on topics, previous interactions with your website, questions, and interests. This makes it relatively easy to find and target relevant people with your ads. When you’re looking for a front end developer, for example, you can target your ads on questions about front end development. Map test: We will test this hypothesis by creating an employer brand video and launch the ad on Facebook with audience X as our target audience. Report: Let the ad run for one week, then evaluate results. If CTR and amount of clicks are good, scale the ad by putting in more budget. If results are lower than expected, make adjustments and redo or mark this as a failed experiment- optimizing your paid channels. By working according to the growth marketing principles, you execute faster while minimizing your ad spend on campaigns that don’t work. Knowing how to read and interpret data within the ad interfaces is crucial though. The best thing about online marketing channels is that everything is measurable. Unlike the traditional offline channels such as TV ads and newspaper ads, you can actually measure ad success directly. This makes it easy to quickly adjust your ads in order to improve the performance. Click-through rate (CTR); the percentage of people that click on your ad. Impressions; knowing how many actually see your ad is important to know whether your ad is being shown to people. Clicks; the number of clicks is important to see how much traffic you get to your site from the specific ad and. Number of conversions; this is probably the most interesting number for you to look at. The number of people that actually apply after seeing or clicking the ad, shows how effective the ad truly was. In order to track conversions, you’ll need the tracking pixel set up correctly and preferably a URL that visitors land on after submitting their application. The quantity of conversions isn’t enough to judge the effectiveness of an ad. The quality matters too and should be kept an eye on. You can measure the quality by checking the source of your applicants (most ATS systems have this feature). If you see that many of the applicants that come in from your Facebook ads are of low quality, you might want to consider another channel (even when the quantity of applicants coming in is high).